Invensas Bonding Technologies (formerly Ziptronix) files an action against Samsung in the U.S. District Court for the District of New Jersey, alleging infringement of six patents relating to the Company’s semiconductor bonding technologies. 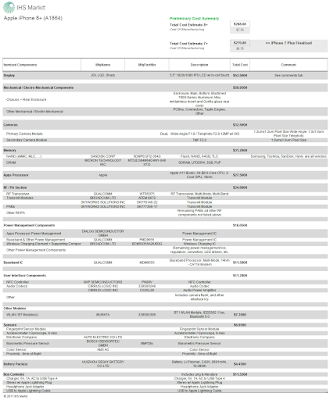 The patents at issue are U.S. Patent Nos. 7,553,744; 7,807,549; 7,871,898; 8,153,505; 9,391,143; and 9,431,368. FotoNation and DigitalOptics MEMS filed an action against Samsung in the U.S. District Court for the Eastern District of Texas, alleging infringement of eight patents relating to imaging technologies. The patents at issue are 8,254,674; 8,331,715; 7,860,274; 7,697,829; 7,574,016; 7,620,218; 7,916,897; and 8,908,932. Canon says it was able to achieve 70% QE at 500nm in monochrome sensor. The continuation of the whitepaper, mostly about extended DR and dual pixel is available here. "The Face ID of iPhone X gives people one more reason to pay $999 for it, but what if the DOOGEE MIX 2 can do this as well? DOOGEE announced they would apply face recognition in MIX 2 for the first time, which will be operated by the front camera. Since there is no room for the fingerprint sensor in full display devices at the front, face recognition may be a trend of the business. However, this is the first time that an Android smartphone using face recognition to unlock the full display. Considering iPhone X will be available in November, and DOOGEE MIX 2 is coming in October, it may become the world's first launched smartphone with face recognition and full display." "Platform 2.1 also expands TRI's portfolio of suppliers, incorporating a new high-fidelity LIDAR system provided by Luminar. This new LIDAR provides a longer sensing range, a much denser point cloud to better detect positions of three-dimensional objects, and a field of view that is the first to be dynamically configurable, which means that measurement points can be concentrated where sensing is needed most. 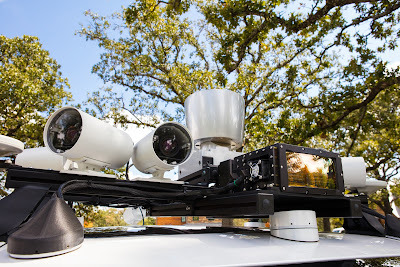 The new LIDAR is married to the existing sensing system for 360-degree coverage. TRI expects to source additional suppliers as disruptive technology becomes available in the future." Sony also added VGA IMX397CLN 2nd generation sensor to its lineup. "The cameras have been calibrated for AR, and the A11 Bionic chip is also optimized for AR. Slow-motion video capture at 1080p is also smoother, at 240 frames per second – double from last year. InstantFlashNews reports that Vivo, one of the largest Chinese smartphone manufacturers, is going to use dual pixel camera for 3D face scanning in its "bi-directional Face Wake" facial recognition technology. "The strong demand is mainly due to high investments in the electronics industry in Asia along with a widely spread upswing in the market. Furthermore, bottle necks in materials and production led to increasing delivery times and these to early order placements." Thanks to JK for the link! Marketwired: Teledyne Dalsa announces production of the new Polarization camera in its Piranha family. First announced in Q2 2017, the Piranha4 Polarization camera is now in full production with improved performance. The camera uses a quadlinear CMOS sensor with nanowire micro-polarizer filters. It captures multiple native polarization state data without any interpolation. With a maximum line rate of 70 kHz, the camera outputs independent images of 0°(s), 90° (p), and 135° polarization states as well as an unfiltered channel. “Polarization brings vision technology to the next level for many industrial applications. It detects material properties such as birefringence, stress, film, composition, and grading etc. that are not detectable using conventional imaging,” said Xing-Fei He, Senior Product Manager. 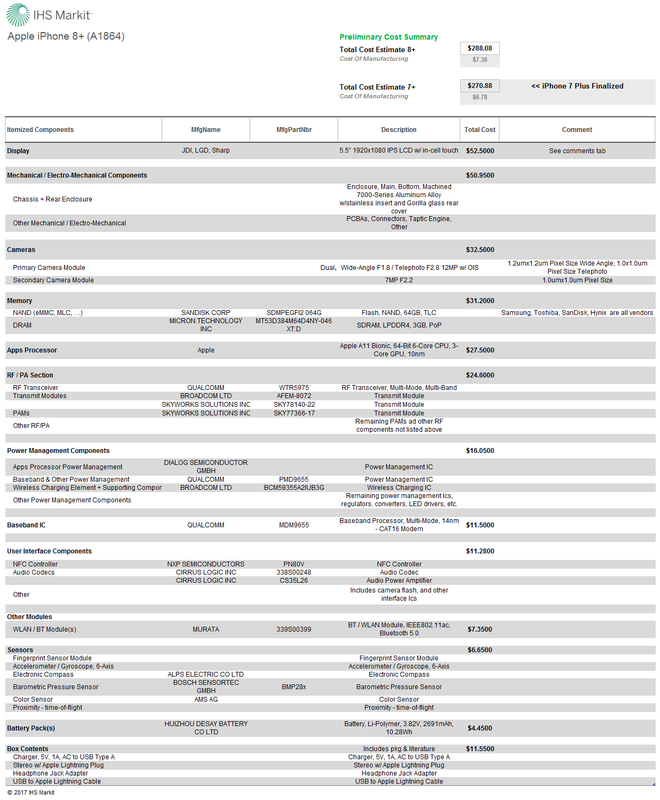 Phil Garrou reviews the recent image sensor advances in its IFTLE 353, including IISW 2017 (Hiroshima) papers and Samsung and Sony news. Hybrid bonding is said to be capturing most of the market. 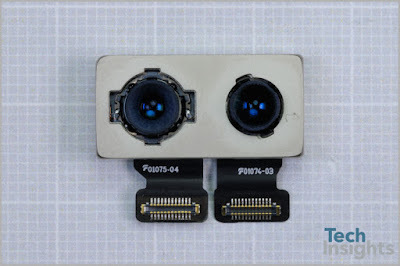 "The image sensor is a sensor that senses and delivers the information. The information detected by the image sensor comprises an image. ABB Ltd, Vishay Intertechnology, Inc, Delphi Automotive LLP, Honeywell International, Inc, Raytek Corporation, Meggitt Sensing Systems, Analog Devices Inc., Infineon Technologies AG, Motorola Solutions, Inc., Robert Bosch GmBH, Siemens AG and others are the major players in the image sensor market." "The FLIR Boson camera core occupies only 4.9cm3 without its lens, including a 320×256 pixel microbolometer and an advanced processor. The system is made very compact and easy for integrators to handle. It includes a new chalcogenide glass for the lens and a powerful Vision Processing Unit for the first time. The thermal camera uses 12µm pixels based on a vanadium oxide technology microbolometer, the ISC1406L, which features a 320×256 resolution and wafer-level packaging (WLP) to achieve a very compact design. The die is half the size of the one in the oldest ISC0901 model, but gives the same definition." "...have a look at a clock with a ticking hand. As a human, you see the clock ticking at a particular speed. But for a turtle it would appear to be ticking at twice that speed. For most fly species, each tick would drag by about four times more slowly. In effect, the speed of time differs depending on your species. This happens because animals see the world around them like a continuous video. But in reality, they piece together images sent from the eyes to the brain in distinct flashes a set number of times per second. Humans average 60 flashes per second, turtles 15, and flies 250." "Intel has made the decision to wind down its Project Alloy reference design, however we will continue to invest in the development of technologies to power next-generation AR/VR experiences. This includes: Movidius for visual processing, Intel RealSense depth sensing and six degrees of freedom (6DoF) solutions, and other enabling technologies..."
The dual rear camera uses 1.22um pixel size in 12MP wide angle sensor and 1.0um pixel is 12MP tele sensor. The 7MP front camera has 1.0um pixel size. "The dual camera module size is 21.0 mm x 10.6 mm x 6.3 mm thick. Based on our initial X-rays it appears the wide-angle camera uses optical image stabilization (OIS), while the telephoto camera does not (the same configuration as iPhone 7 Plus). The wide-angle Sony CIS has a die size of 6.29 mm x 5.21 mm (32.8 mm2). This compares to a 32.3 mm2 die size for iPhone 7’s wide-angle CIS. We do note a new Phase Pixel pattern, but the big news is the absence of surface artifacts corresponding to the through silicon via (TSV) arrays we’ve seen for a few years. A superficial review of the die photo would suggest it’s a regular back-illuminated (BSI) chip. 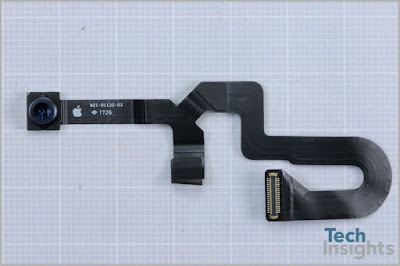 However, we’ve confirmed it’s a stacked (Exmor RS) chip which means hybrid bonding is in use for the first time in an Apple camera!" "Smart glasses that replace or complement the desktop likely face a long-haul journey. There are a number of technical issues to overcome, including FOV, weight, ergonomics and comfort, and extended AR use. Tractica estimates that the monthly active users (MAUs) for smartphone/tablet enterprise AR will be 49 million by the end of 2022. 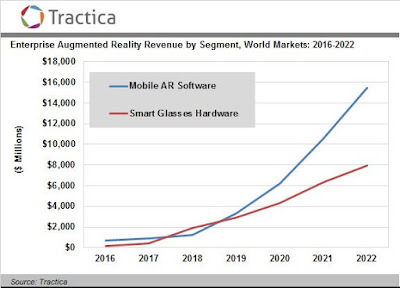 In contrast, the installed base of enterprise smart glasses users at the end of 2022 will be approximately 19 to 21 million." "APDs have relatively high excess noise, a limited gain-bandwidth product, and high operation voltage, presenting a need for alternative signal amplification mechanisms of superior properties. As an amplification mechanism, the cycling excitation process (CEP) was recently reported in a silicon p-n junction with subtle control and balance of the impurity levels and profiles. Realizing that CEP effect depends on Auger excitation involving localized states, we made the counter intuitive hypothesis that disordered materials, such as amorphous silicon, with their abundant localized states, can produce strong CEP effects with high gain and speed at low noise, despite their extremely low mobility and large number of defects. Here, we demonstrate an amorphous silicon low noise photodiode with gain-bandwidth product of over 2 THz, based on a very simple structure." On the requirements side, the array of demands is sobering. They include, of course, a bevy of specific requirements: a 200-m range, to give the vehicle passenger a minimum of seven seconds of reaction time in case of an emergency; laser eye safety; the ability to capture millions of points per second and maintain a 10-fps frame rate; and the ability to handle fog and other unclear conditions. 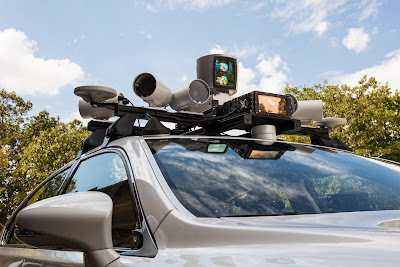 But Eichenholz also stressed that an autonomous vehicle on the road operates in a “target-rich” environment, with hundreds of other autonomous vehicles shooting out their own laser signals. That environment, he said, creates huge challenges of background noise and interference. And he noted some of the same issues with supply chain, cost control, and zero error tolerance. PRNewswire: OmniVision announces an automotive reference design system (ARDS) that allows automotive imaging-system and software developers to mix and match image sensors, ISPs and long-distance serializer modules. 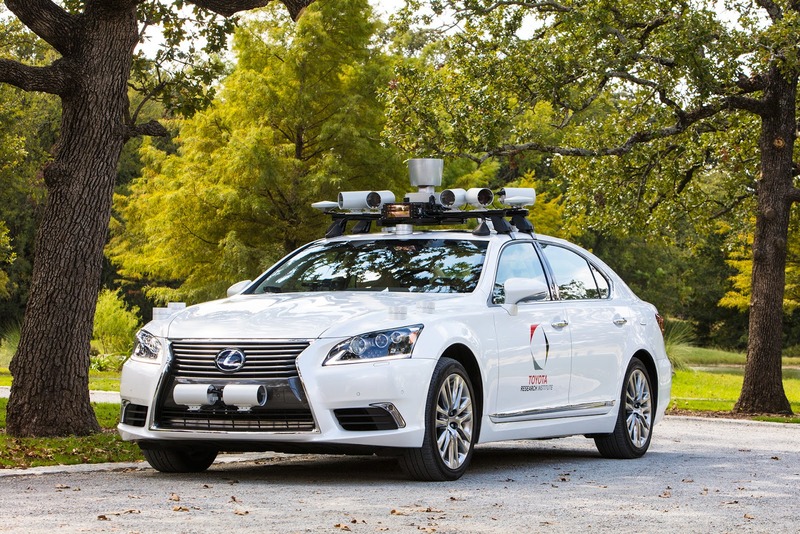 The imaging-system industry is anticipating significant growth in ADAS, including surround-view and rear-view camera systems. NCAP mandates all new vehicles in the U.S. to be equipped with rear-view cameras by 2018. Surround-view systems (SVS) are also expected to become an even more popular feature for the luxury-vehicle segment within the same timeframe. SVSs typically require at least four cameras to provide a 360-degree view. OmniVision's ARDS demo kits feature OmniVision's 1080p60 OV2775 image sensor, optional OV495 ISP and serializer camera module. The OV2775 is built on 2.8um OmniBSI-2 Deep Well pixel with a 16-bit linear output from a single exposure. "Samsung Electronics is going to start mass-producing ‘3-layered image sensor’ in November. 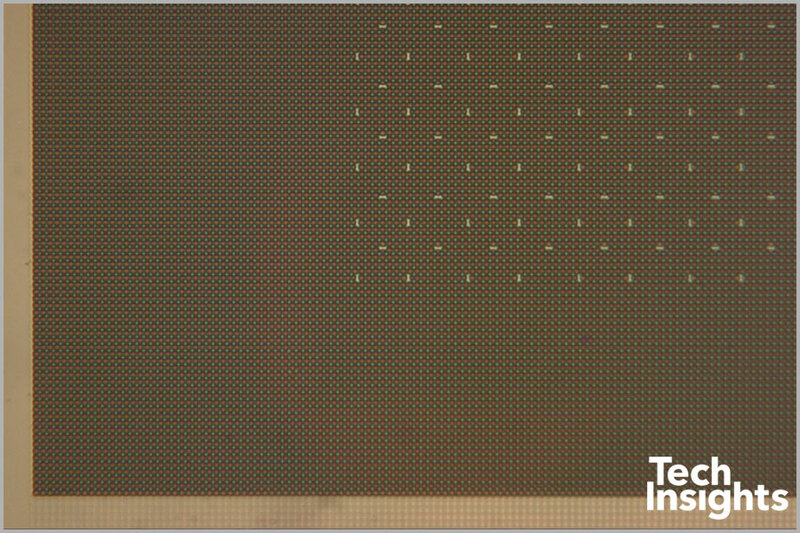 This image sensor is made into a layered structure by connecting a system semiconductor (logic chip) that is in charge of calculations and DRAM chip that can temporarily store data through TSV (Through Silicon Via) technology. Samsung Electronics currently ordered special equipment for mass-production and is going to start mass-producing ‘3-layered image sensor’ after doing pilot operation in next month. SONY established a batch process system that attaches a sensor, a DRAM chip, and a logic chip in a unit of a wafer. On the other hand, it is understood that Samsung Electronics is using a method that makes 2-layered structure with a sensor and a logic chip and attaches DRAM through TC (Thermal Compression) bonding method after flipping over a wafer. From productivity and production cost, SONY has an upper hand. It seems that a reason why Samsung Electronics decided to use its way is because it wanted to avoid using other patents." Bloomberg reports that AR headset startup Magic Leap is in the process of raising a new financing round of more than $500M at the valuation close to $6B. The company has already raised more than $1.3B in the previous rounds valuing it at $4.5B. "According to people familiar with the company’s plans, the headset device will cost between $1,500 and $2,000, although that could change. Magic Leap hopes to ship its first device to a small group of users within six months, according to three people familiar with its plans." 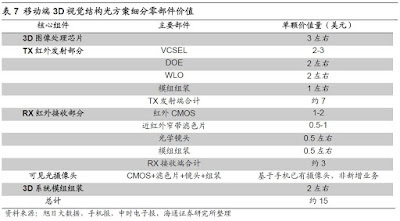 InstantFlashNews quotes a number of sources in Chinese language saying that Haitong Securities analysts forecast the global sales of smartphones equipped with 3D sensors to reach $992.5B in 2020. The sales of smartphones with front structured light camera will be $667.8B, while the sales of smartphones with rear ToF camera will take $324.7B. 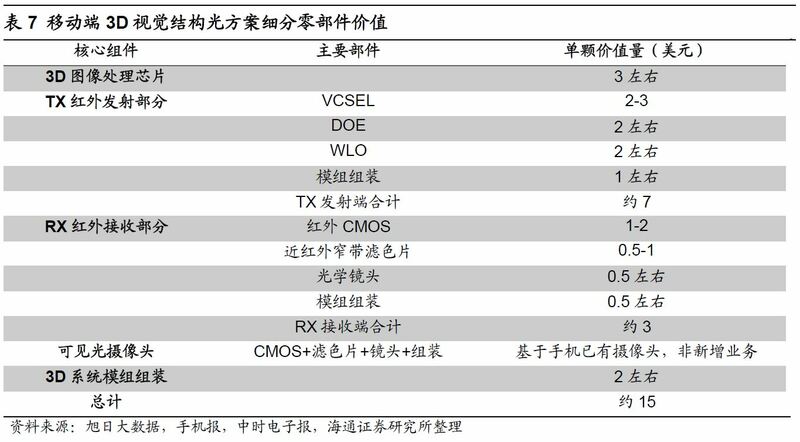 Haitong Securities estimates iPhone X 3D structured light components cost at ~$15, with 3D image sensor ~$3, TX component ~$7, RX ~$3, and system module about $2. "A real breakthrough was achieved in the field of camera calibration. Our initial goal was to simply find the optimum procedure to calibrate a DME660 camera. The result however is a revolutionary finding, that not only includes the compensation algorithm but also a simple desktop hardware for distance calibration. No need any more for large target screens and moving stages! Simply put your camera in a shoebox sized flat field setup and calibrate the full distance range with help of the on-chip DLL stage. Done!" "You won't recognize our epc660 flagship QVGA imager in version 007! Improved ADC performance, 28% higher sensitivity, as well as low distance response non-uniformity (DRNU) of a few centimeters only (uncalibrated). We took 3 rounds (versions 004-006) in the fab transfer process and did not let go before we got it right." Digitimes believes that iPhone X "new features... such as 3D sensing are likely to become new standards for next-generation smartphones launched by Android-based smartphone vendors. 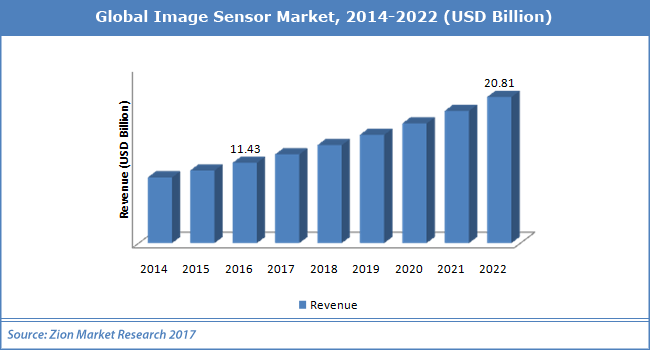 The demand for 3D sensor modules is likely to experience an explosive growth in 2018-2019. Major players in the Android camp, including Samsung and Huawei, certainly will jump onto the bandwagon."